The family that started it all. From left to right, Monica Archondo (founder), Sherri Archondo, Meryl McBride, and Fernando Archondo. 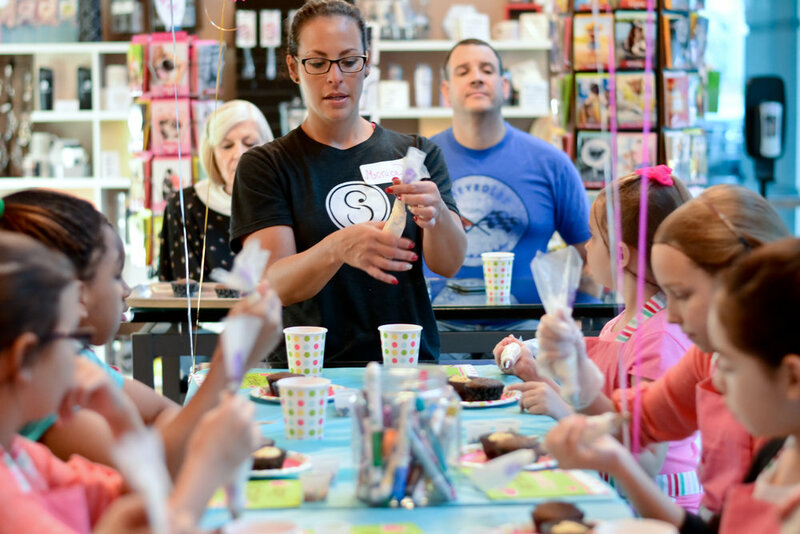 Sweet Signatures is a family-owned and operated business, leaving a delicious mark in the experiences – and taste buds – of its customers every single day. Nestled comfortably between routes 28, 7 and Sterling Boulevard in Sterling, VA, we serve as a welcoming respite for morning and evening commuters. An ever growing menu selection of handmade chocolates, unique sweets, fresh pastries, healthy alternatives, gourmet foods, coffee/drinks/juices, and shakes aim to cater to the needs of a diverse local customer base, and the business remains all ears when it comes to community feedback and suggestions. From new product development to coffee slinging to party planning, we do it all out of this incredible location with the help of our amazing team. The journey began in 2008! Click below to learn more about how Sweet Signatures came to Sterling. Working with a Cupcake Birthday Party at Sweet Signatures. Lot's of fun and challenging work! Team Members are treated like family with their ideas and inspirations always being valued and used to grow the business. Whether you are working on a marketing blitz or turning your baking ideas into a marketable reality, you will have the freedom to design, create, and develop. As a team, we constantly drive ourselves to improve, and keep each other accountable to the quality of work we do. You will be part of a hard working, honest and humble crew who will push you to expand your comfort zone, while simultaneously coaching you as you develop in your career at Sweet Signatures. We believe in a team rewards system (everyone works together to earn), and we regularly have dinners together (funded by our compiled tips) to grow our team camaraderie, and to truly get to know one another on a more personal level. Team Members will also get discounts on all of our products in store (from gift cards and desserts to all of the chocolates your heart can desire). Head over to our hiring application and jump start your career with us today!